Download "Job Description. Barnet Band & scale range. No. of staff responsible for 0 Budget responsibility ( ) Purpose of Job"
2 Ensure payments are accurate and reflect agreed performance/payment mechanisms Work collaboratively with colleagues in the Commercial team to ensure a consistent commercial approach is taken, interdependencies are managed effectively, and a rich understanding of performance is developed and reported to commissioners and members Undertake research into best practice contract management and the outcomes achieved by others to support benchmarking and apply lessons learned to improve Barnet s arrangements Ensure that the needs of customers and outcomes for service users drive contract management activity, and that customer feedback is sought and used as part of the contract management processes Identify problems early and intervene appropriately to understand causes and collaboratively develop solutions, initiating remedial/improvement activity as required Assist the partnership managers and contract managers to intervene, analyse, manage and resolve business conflicts with delivery units and partners Engage with the Assurance Group to inform audit activity and provide the information required for it to undertake its duties to assure the Board that operational and governance processes and procedures are fit for purpose. Key Accountabilities Financial & Risk Management Monitor performance to ensure value for money is being delivered through the contracts / service level agreements, supporting effective management of the Council s resources Monitor contractor compliance with relevant legislation, statutory duties and Council policies to manage risk appropriately. Respond to internal audit reviews and implement action plans within agreed deadlines. 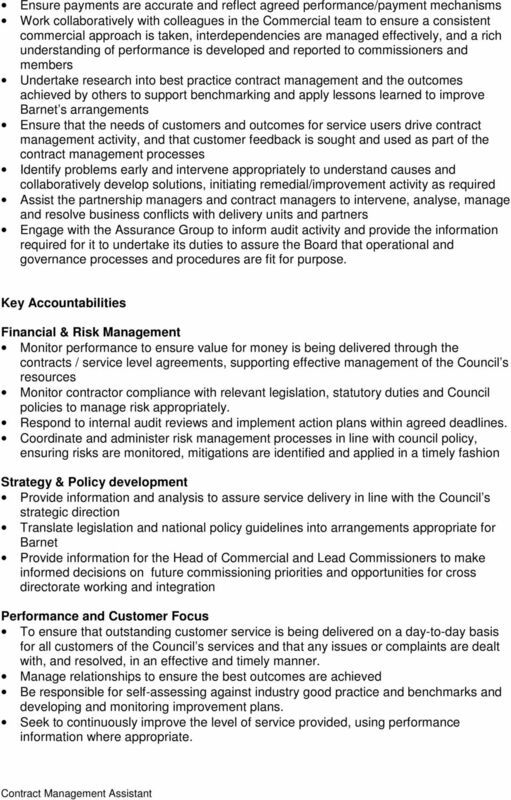 Coordinate and administer risk management processes in line with council policy, ensuring risks are monitored, mitigations are identified and applied in a timely fashion Strategy & Policy development Provide information and analysis to assure service delivery in line with the Council s strategic direction Translate legislation and national policy guidelines into arrangements appropriate for Barnet Provide information for the Head of Commercial and Lead Commissioners to make informed decisions on future commissioning priorities and opportunities for cross directorate working and integration Performance and Customer Focus To ensure that outstanding customer service is being delivered on a day-to-day basis for all customers of the Council s services and that any issues or complaints are dealt with, and resolved, in an effective and timely manner. Manage relationships to ensure the best outcomes are achieved Be responsible for self-assessing against industry good practice and benchmarks and developing and monitoring improvement plans. Seek to continuously improve the level of service provided, using performance information where appropriate. 4 PERSON SPECIFICATION Theme Education & professional development Knowledge Description Educated to A-level or equivalent by experience, preferably in a commercial, contracts and/or procurement discipline. Evidence of continued professional development Knowledge of the commissioning cycle and procurement process in local government Knowledge of commissioner/provider relationships and boundaries An understanding of local authorities and the context in which they operate. Skills & abilities Good oral and written communication skills Good interpersonal skills with the ability to form relationships with a variety of stakeholders Ability to manage, interpret and present large amounts of performance and other data submitted by contractors into key themes or issues Excellent IT skills, including ability to fully utilise standard Microsoft Office products, particularly Excel (essential) and Access (desirable) Excellent organisational and administrative skills Experience Special requirements Experience of monitoring and reporting on delivery against policy/projects/contractual or SLA requirements Experience of commissioning activity and developing relationships with third party suppliers or partners Experience of identifying and resolving problems with third parties Experience of interpreting, responding to and implementing policy guidelines. 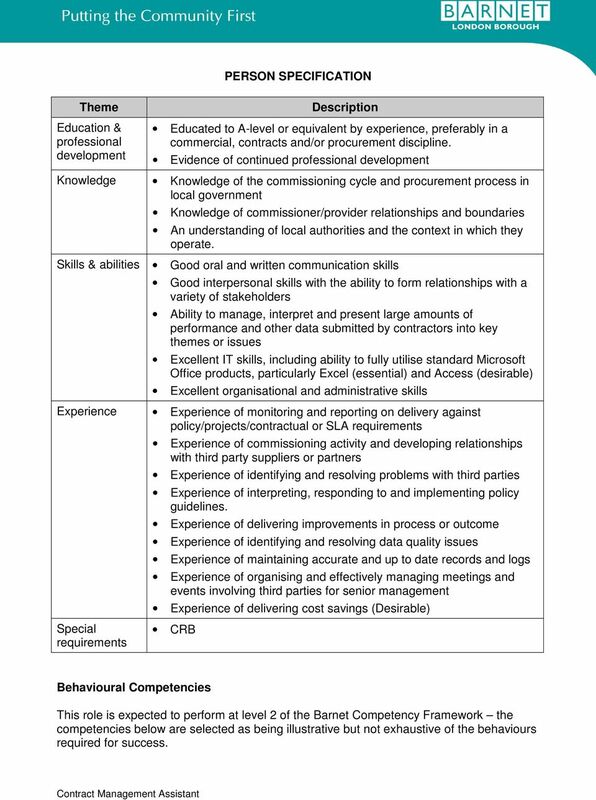 Experience of delivering improvements in process or outcome Experience of identifying and resolving data quality issues Experience of maintaining accurate and up to date records and logs Experience of organising and effectively managing meetings and events involving third parties for senior management Experience of delivering cost savings (Desirable) CRB Behavioural Competencies This role is expected to perform at level 2 of the Barnet Competency Framework the competencies below are selected as being illustrative but not exhaustive of the behaviours required for success. 5 Competency PERSONAL EFFECTIVENESS Communicating and Influencing Respecting Others Striving for Excellence Political awareness Analytical skills LEADERSHIP Setting Direction Managing Performance Key Requirements Has the ability to distil complex data / concepts into simple summaries to be shared with a variety of audiences Experience of supporting resolution of business conflict between vendors and suppliers to a successful outcome Good interpersonal skills and able to engage, challenge, support and influence colleagues and suppliers. Champions a culture that values equality and diversity, and monitors that the delivery of these in service provision Demonstrates a high level of personal drive and energy Commitment to achieving high quality customer service Ability to work effectively in a complex political environment Strong problem solving and analytical skills. Ability to analyse data \ identify current and future trends to produce meaningful reports around supplier performance. Ability to interpret a range of documentation in order to produce findings and recommendations for actions/areas of improvement and also cross cutting issues and scope for integration with other services Fosters a culture of continuous improvement and responsiveness to change Shares the vision for the future and strives to achieve it Evidence of interpreting, responding to and implementing policy guidelines. 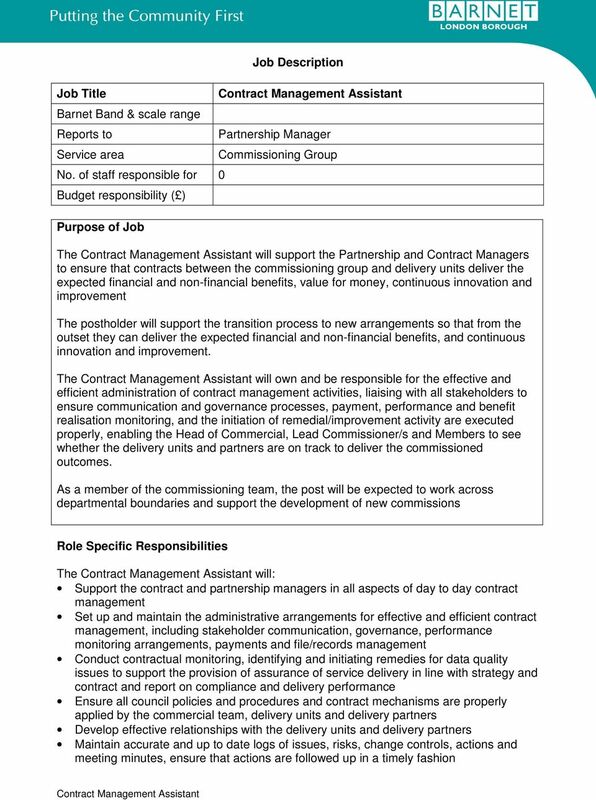 Action-orientated with a can-do attitude Contract management experience with a track record of achieving desired outcomes and best value from contractual arrangements Understanding of the development and implementation of commissioning frameworks in a multi-disciplinary and partnership environment. 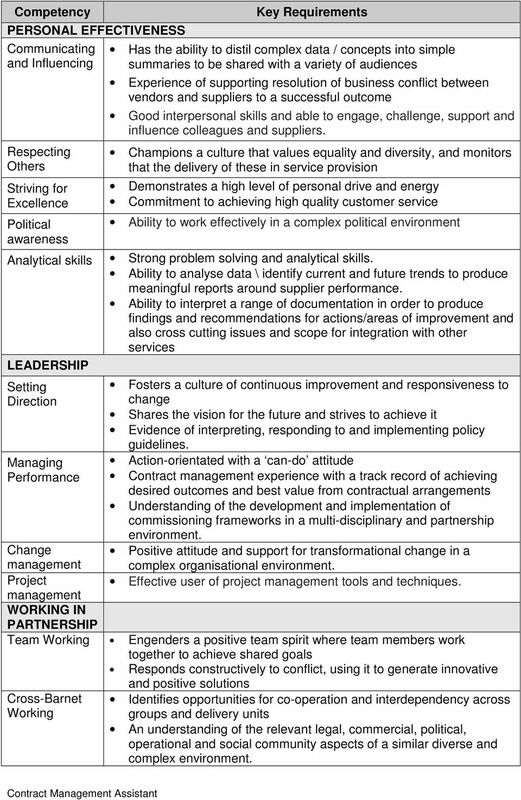 Positive attitude and support for transformational change in a complex organisational environment. Effective user of project management tools and techniques. Change management Project management WORKING IN PARTNERSHIP Team Working Engenders a positive team spirit where team members work together to achieve shared goals Responds constructively to conflict, using it to generate innovative and positive solutions Cross-Barnet Working Identifies opportunities for co-operation and interdependency across groups and delivery units An understanding of the relevant legal, commercial, political, operational and social community aspects of a similar diverse and complex environment. 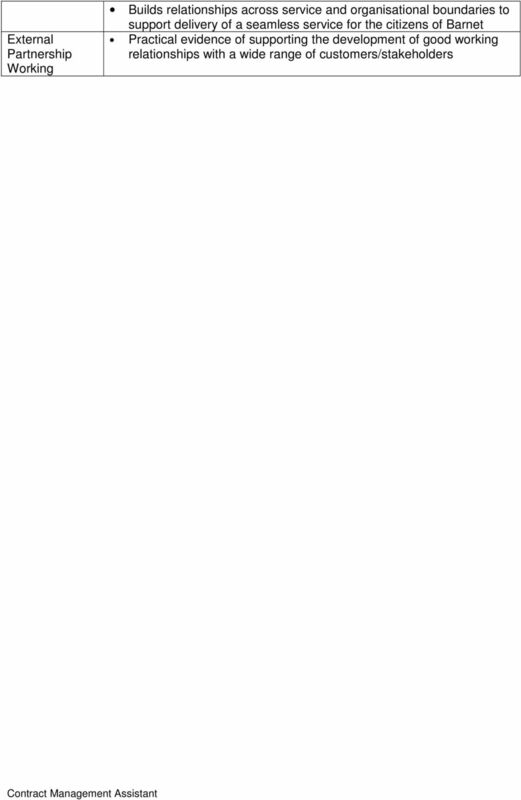 Head of Engineering Job Description (Job Code and Level: E006) Definition: Overall responsibility and accountability for the Engineering function across the UK which will include people and budgetary management. Job Description. Undertake clinical audit and healthcare service monitoring and review as required by the commissioner and CQC. 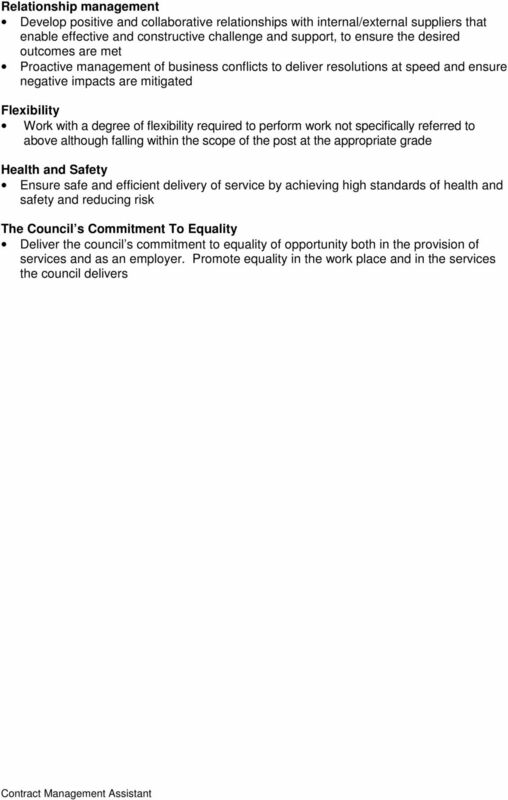 SOMERSET COUNTY COUNCIL JOB DESCRIPTION. Quality Assurance for children in need of protection and children looked after. IPDS. Green Book Employees. An Integrated Performance Management, Pay and Grading System. Technical 2. Making West Midlands Safer. www.wmfs. To plan and facilitate transformational change in the way that people are managed within the Trust. The role will require the management of consultancy and in-house teams in the successful execution of the estates strategy.